Why Should You Invest in Tech Products to Promote Your Brand? Tech products are some of the hottest promotional items on the market. From chargers to cell phone cases to laptop bags, tech-related accessories can build up a buzz for your company. They also offer a wide variety of ways for you to promote your business, from small logos on keychain-sized devices to a full company slogan on laptop bags and backpacks. 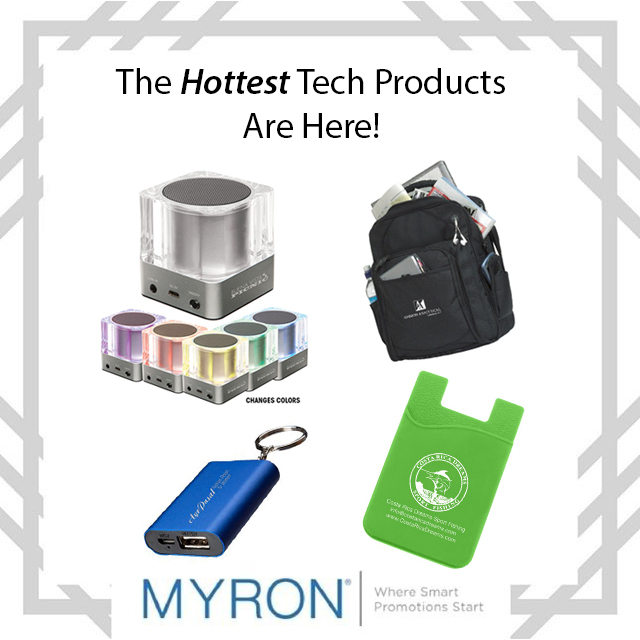 Here are four popular tech products at Myron and how they can help you promote your brand. This tech accessory easily clips onto a keychain, letting users add 1000 mAh of power whenever their cell phone or other tech item gets low. The aluminum housing is available in a choice of five colors. Your customers can take the music with them wherever they go. This trendy crystal bluetooth speaker offers the ultimate portability and even changes colors! It transmits through Bluetooth and can be recharged via any USB port. Your customers will be rockin’ while your logo is poppin’! Bring your company name and logo up front and center with this spacious computer briefcase. In addition to the securely padded central compartment, this briefcase backpack contains a separate laptop compartment and plenty of additional space. What better way to make sure your logo is with your customers all day than putting it on this Silicone Smartphone Wallet. These are all the rage right now, and for good reason. They’re handy, compact, stylish and come in a variety of colors! At Myron, we strive to help you choose products that will keep your brand on customers’ minds. Need help choosing products that fit your business? Let us know! Which Promotional Products Should I Bring to a Trade Show?